Exactly one week from today, Netflix will debut their new series Voltron: Legendary Defender, offering a dose of nostalgia for fans of the 1980s cartoon this summer. To get everyone ready for this epic sic-fi adventure, we have a new clip and a sizzle reel, which teases an iconic moment from the original cartoon. This clip gives us our first look at the entire process of forming Voltron, after the Galra Empire sends a mighty Robeast to challenge the Paladins. While the clip from YouTube may have been enough to tide you over, IGN has also debuted a sizzle reel from the show, which first premiered at the Voltron WonderCon panel this spring. This sizzle reel gives us a better look at the individual pilots in action, both in and out of their robotic fighting lions. We don't know for sure how much more footage will be released before the June 10 premiere, so this may be your last glimpse at the series before it debuts in just seven short days. From days long ago, from uncharted regions of the universe comes the Netflix Original Series, DreamWorks Voltron Legendary Defender! DreamWorks Animation reimagines one of the most popular fan-favorite shows of all time in this all-new comedic action-packed animated series from executive producer Joaquim Dos Santos (The Legend of Korra, Avatar: The Last Airbender) and co-executive producer Lauren Montgomery (The Legend of Korra). Five unsuspecting teenagers, transported from Earth into the middle of a sprawling intergalactic war, become pilots for five robotic lions in the battle to protect the universe from evil. Only through the true power of teamwork can they unite to form the mighty warrior known as Voltron. The voice cast includes Kimberly Brooks as Princess Allura, Rhys Darby as Coran, Josh Keaton as Shiro/Black Lion, Tyler Labine as Hunk/Yellow Lion, Jeremy Shada as Lance/Blue Lion, Bex Taylor-Klaus as Pidge/Green Lion and Steven Yeun as Keith/Red Lion. The streaming service announced Voltron: Legendary Defender back in early January, along with another series, Guillermo del Toro's Trollhunters, but it isn't known when that series may debut yet. Another report from February revealed that the new Voltron series will follow the formula of the original animated series, Voltron: Defender of the Universe. The original series Voltron: Defender of the Universe ran for three seasons in the 1980s, which eventualy spawned a number of follow-ups. The animated feature film Voltron: Fleet of Doom debuted in 1986, with Voltron and the Third Dimension arriving in 1998. The last attempt to revive this franchise was 2011's Voltron Force. 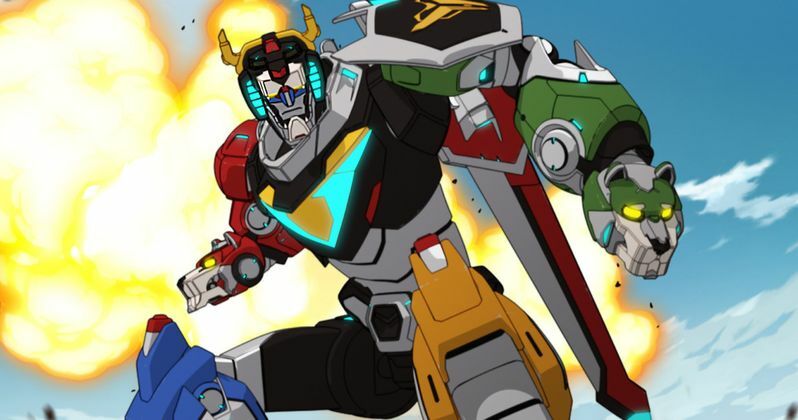 We'll have to wait and see if Voltron: Legendary Defender wil be a big hit, but until then, take a look at the clip and sizzle reel below as an iconic TV show returns.